The new Thermalstrike bed bug heated luggage is one of the coolest new bed bug products to hit the market in quite some time. Harnessing the power of heat, the Thermalstike heated suitcase can kill any potential hitchhiking bed bugs that may attempt to make there way home with you after a trip. We were recently sent the larger of the two models by Thermalstrike to see what we thought and will be sharing our findings in the following review. Bed bugs are often brought home inside the suitcases of travelers who have stayed in bed bug infested areas such as hotels, cruise ships, shelters, etc. Up until now, suitcases could only be treated inside of bed bug heaters in which the entire suitcase would be heated to 120-140 degrees F for a period of time. Bed bugs are very susceptible to heat and can be killed at constant temperatures above 117 degrees F. Although an effective method, the traveler had to wait until they returned home to use the bed bug heat box and could not treat their belongings before returning home or during their trip. The Thermalstrike Heated Suitcase changes everything by placing the heating element inside the suitcase on both sides allowing it to treat the interior contents before leaving a hotel or potentially bed bug infested area. This is a major plus as many travelers want to treat their belongings several times during a trip to prevent infesting other destinations or their personal vehicle during a trip. The suitcase itself looks no different than your ordinary mid to higher-level suitcase offering many of the features you may find on a comparable lightweight hard plastic suitcase. The unit is well made with a rigid composite plastic exterior, which protects the interior contents along with convenient rolling wheels like many of the suitcases you see at the airport (rolls on 2 or 4 wheels). The interior compartments are laid out well divided in two halves allowing you to open the suitcase without your belongings disorganizing (a nice plus when going through TSA screening lines). The suitcase also has a nice zipper-locking feature that prevents the zippers from opening during transit. The zipper-locking feature has a programmable combination, but also has a TSA compliant key hole that can be opened with a TSA master key. 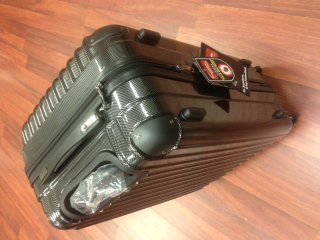 The suitcase is available in a 22” carry on and larger 26” upright. Again what makes this suitcase unique is that it kills bed bugs. To operate the suitcase you simply plug it into any electrical outlet and the thermalstrike heater suitcase does the rest. The luggage is equipped with thermal heat tape, which lines the interior of the outer shell (you can’t see it, but it’s there). This heat tape heats the contents of the suitcase evenly on all sides until the inner most section of the suitcase hits 140 degrees F., which is well above the 120 degrees F. needed to kill all stages of bed bugs and their eggs. On the outside of the suitcase there is a green light that automatically turns off once the suitcase hits 140 degrees F (so you know its done). It’s just that easy!